APPEARANCE: Ippondatara has one thick, trunk-like leg and a single saucer-like eye. It lives deep in the mountains of Japan. It is especially well-known in the mountains bordering Wakayama and Nara Prefectures (old Kii and Yamato Provinces), though sightings have been reported in other neighboring prefectures as well. 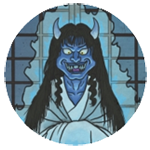 BEHAVIOR: Ippondatara is a shy yōkai, and tends to stay away from inhabited areas. It moves about by hopping around and doing somersaults. It avoids humans, though on winter days it is not uncommon to find the unique prints of this yōkai’s large, single foot in the snow. INTERACTIONS: While it is mostly harmless, once per year on December 20th, the ippondatara turns violent. Those entering the mountains on that day who run into the ippondatara are squashed flat under its powerful foot. Because of this, December 20th is considered an unlucky day in the areas where this yōkai lives. People stay out of the mountains then. ORIGIN: The name ippondatara comes from tatara, the bellows that a blacksmith would use in the old days. This yōkai is said to resemble a master blacksmith who lost the use of one eye from years of starting at the intense flames, and lost the use of one leg from years of heavy work pumping the bellows. There are many theories about the origin of this yōkai. In some villages, it is considered to be a cousin of a certain breed of kappa called gōrai which—every winter—transform from river spirits into mountain spirits called kashambo until they return to the rivers in spring. Ippondatara is said to be a kind of kashambo. Other explanations describe the ippondatara as the ghost of a woodcutter who cut off one of his legs in penance for some crime. Or it may be the ghost of a famous one-legged, one-eyed robber named Hitotsudatara who lived in the mountains of Wakayama and had supernatural strength. It may even be the ghost of a giant boar who used to roam the mountains killing hunters. A high priest was able to bind the boar’s spirit and keep it from harming people, but the conditions of the magic that binds this ghost allow it to roam free one day per year—on December 20th. It has also been suggested that it is a kind of mountain kami which was corrupted over the ages and became a yōkai. A single eye is a common feature among mountain spirits, and other one-eyed yōkai (such as hitotsume kozō) originated as mountain kami as well.